One of the things that were added in this model is the USB port at the back along with all the other ports which can be used to play things from a flash drive. Along with that, there are two HDMI ports and luckily both of them support 4k HDR for this 4k projector. Other noticeable ports can include the audio output one. Most projectors do have an internal speaker but they are never enough. You always have to adjust the voice through some external gadget that could be supported by the system. 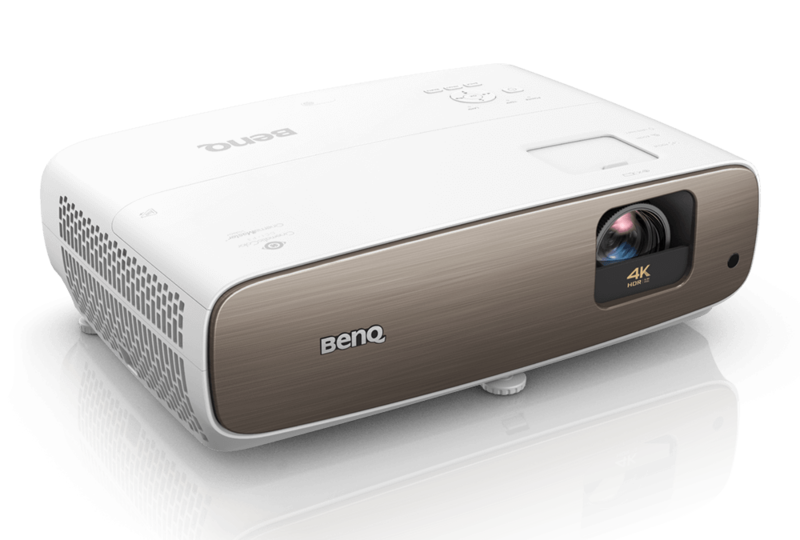 However, BenQ HT 3550 offers inbuilt speakers which will be enough for you to watch a movie or any play your game with ease and the perfect amount of sound needed as the projector is also suitable for gaming. One of the specifications that stand out is the dynamic iris of the projector. This helps the projector in assessing the picture on the screen, after which it automatically adjusts the brightness for you by opening or closing the iris depending upon how much light is needed. This in effect adjusts the contrast and black levels of the overall projection which is evidently better in this model when compared to previous 4k projectors. Most of us prefer watching 3D movies and our still a big fan of them. Well, if you have this projector, you can watch it at home with just the needed amount of 3D effect. This is because of the fact that this projector shows it in 1080p instead of converting it into 1080i which is what most people have a problem with when it comes to 4k projectors. However, it is still a projector and so some amount of quality needs to be cut down but you will still be able to enjoy 3D movies. With just the first thing that you will watch on this projector after buying it, you will be able to notice the color quality that it offers. The dynamic iris works well with the color accuracy and thus provides the best picture quality that you can expect from a DLP projector. This is one of the most significant features that have been improved in comparison to other 4k DLP projectors which almost always have this light border around the screen. BenQ HT 3550 has resolved this issue to a great extent and the border is now more or less invisible.